Congratulations to ECLF attorney Mindy Stannard on her appointment to the Oregon State Bar House of Delegates for Region 5! 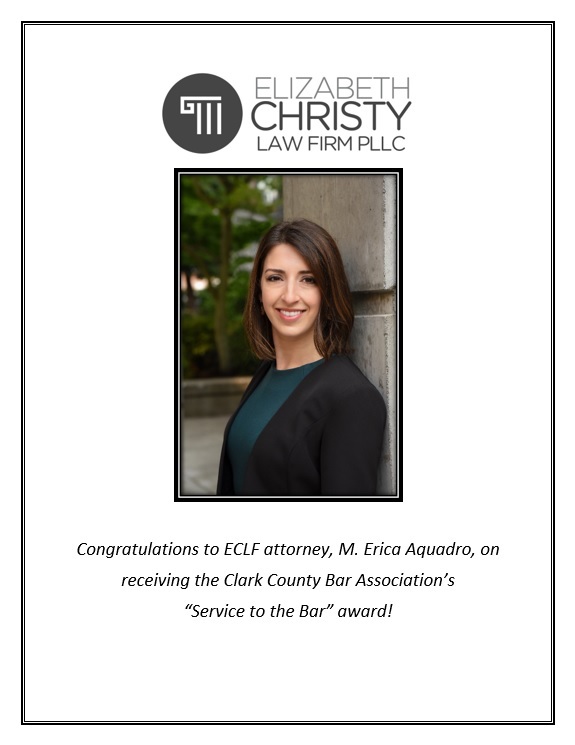 Congratulations to ECLF attorney, M. Erica Aquadro, on receiving the Clark County Bar Association’s “Service to the Bar Award”! Elizabeth Christy has been appointed as a member of the Board of Director of DRAW: Domestic Relations Attorneys of Washington. Congratulations! Anna has been appointed Social Chair of the Clark County Bar Association Young Lawyers Section for 2018-2019. M. Erica Aquadro Appointed President of the Clark County Bar Association Family Law Section for 2018-2019. Erica has been appointed President of the Clark County Bar Association Family Law Section for 2018-2019.